Rainbow Riches Reels of Gold by Barcrest is a 10 reel, 100 payline slot. This slots online UK uses Colossal Reels technology which you would typically find in WMS slots. Watch out for the magical fairy who can win you magic wilds, a 5x multiplier, free spins, bonus features, butterfly wilds, symbol upgrades and more. In true Barcrest fashion, there is also the Big Bet Mode feature which gives you 5 linked spins and the chance to win up to 50 free spins. Stakes here start from 10p to £500 a spin. At one point in time, all the slot machines all over UK were owned by Barcrest. The company is one of the most respected in the industry. They made their start in 1968 and are still churning out high quality games decades later. 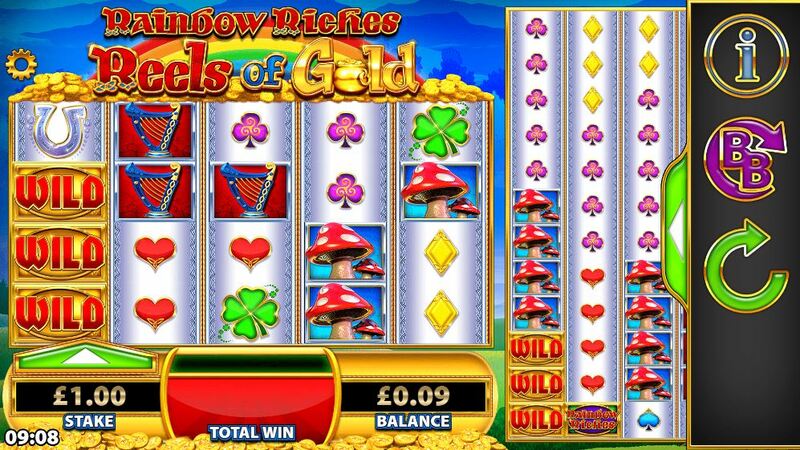 Their entire Rainbow Riches slot series is highly popular not just in its UK hometown, but among players globally. Find more games on Easy and join today. This slot has a colourful design and an Irish luck theme. Symbols on the reels include; horseshoes, mushrooms, rainbows, harps, the Rainbow Riches symbol, 4-leaf clovers and of course the lucky leprechaun. The Leprechaun pays the highest value rewarding up to 500x your bet when you land 5 of them on a payline. The symbol can also land as stacked on the reels. Rainbow Riches Reels of Gold has an unusual reel setup including a 5×4 reel set towards the left and a 5×12 Colossal Reel setup towards the right. Wild symbol -The Rainbow Riches symbol can turn wild whenever it forms part of a win. It can replace all other symbols except the Free Spin one. Keep an eye on the reels because sometimes you could get a full reel of Rainbow Riches icons. This occurs on the main reel set and can easily transfer to its sister reel on the Colossal Reel set. 2 or 3 can win you big payouts. -Super Stacked Wilds feature – the fairy strikes fills 1 or more reels on the main set with Rainbow Riches symbols. This transfers on to the Colossal Reel set and turns those reels wild. -Magic Wilds feature – Magic Wilds appear on both reel sets. They slide up and down and lock in position transforming the particular reel position wild. -Wild Burst feature – butterflies land on both reel sets and the symbols covered by them change into wilds. -Wishing Well Bonus feature – all heart, spade, club and diamond symbols turn into Wishing Well symbols. These can then transform into higher paying symbols like the harp, shamrock, mushroom, horse shoe, or wild. -Reel Win Multipliers feature – players are rewarded multipliers of up to 5x. -Near Miss Free Spins feature – when 2 Free Spins bonus symbols land, the fairy strikes the reels and adds additional bonus symbols which in turn activate the Free Spins feature. -Near Miss Win feature – when the fairy strikes, the reels shift to help you form a winning spin. 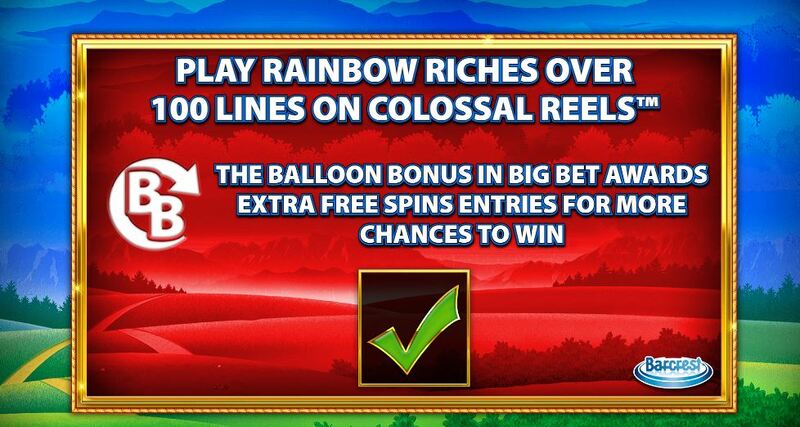 Free Spins feature -The free games are activated when players land 3 or more balloon bonus symbols. The number of balloon symbols that hit will determine how the number of picks you get. The more picks you get, the more spins you win. Big Bet Mode feature -The big bet mode feature offers you a series of 5 linked spins, but at a higher cost. This slot has its variance in the middle and big wins are available in all the features. The highest possible win could be 500x your bet per spin likely from the Free Spins feature. There's a lot to love here. Easy Slots also recommends that you try Monopoly: Bring The House Down.